I don’t know how I missed this shortcut for so many years, but it has made my photo editing workflow a little smoother. 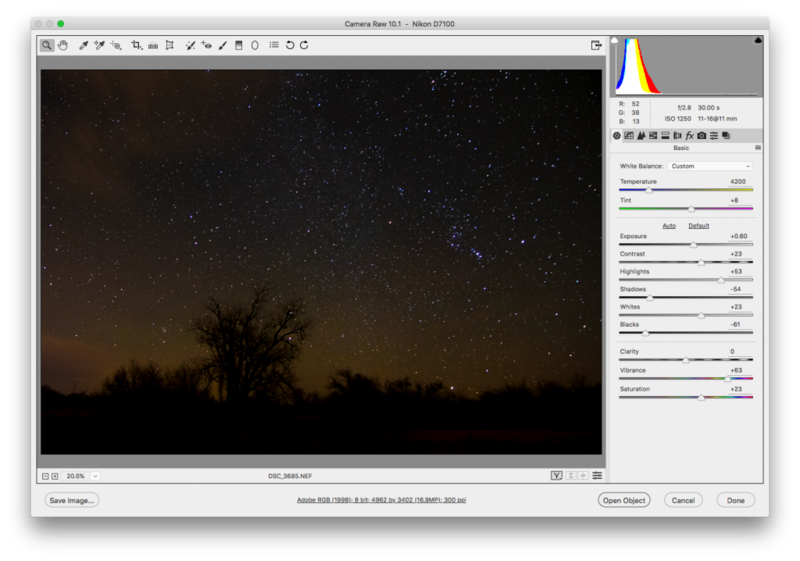 I really like the tools in the camera raw editor for photo toning and color work, but I don’t like the way that it handles cloning and the lack of layers. The drawback with the raw editor for me has been that after I click the Open Image button at the bottom of the screen, my raw editing tools are gone. There is a way to go back and forth between the raw editor and Photoshop seamlessly. With the raw file open in the raw editor, hold down the Shift key, the Open Image button will change to Open Object. The raw image is opened in Photoshop, but it is a Smart Object, you can modify the image in Photoshop and double clicking it will allow changes to made in the raw editor again. You can go back and forth between the Photoshop and the raw editor as often as necessary. Unfortunately, if you do your raw editing in Lightroom, I don’t believe there is a way to work back and forth. This entry was posted in Bismarck State College, Graphic Design and Communications, Photography, Photoshop by admin. Bookmark the permalink.